As we predicted last year, TCS has now become the first of the Indian majors to break the Global IT Services Top 10 for revenues, replacing CGI. Talk to any incumbent Western service provider today, and the one making them all tremble from the sub-continent is TCS. So what's the secret sauce? TCS' aggressive targeting of renewals and new business, particularly in continental Europe is an important factor in driving its assault on the leaders. Moreover, TCS is frequently seen as being the most flexible service provider on pricing and terms, and has a developing reputation for winning any deal anywhere in the world at any price, if it really wants: it depends on what its leadership thinks is important, what its perception of the market is, and what it needs to tell its stock-holders. The firm is increasingly being perceived by many today as an alternative provider to the Western Tier 1s, that can come in and fix messy contracts and implementations; it has shown an appetite and willingness pick up a lot of the low margin, low value work that seemingly every Western Tier 1 wants out of and make the deals profitable and leverageable across clients. Not only that, TCS is having much more success de-linking the direct correlation of revenues from FTEs: the firm has a laser-sharp focus on managed services, fixed price projects and has successfully monetized its product group. The sheer size of its referenceable client base and the executive connections of its leadership, is a huge strength. In addition, its tunnel-vision on developing its platform-based solutions is really helping the firm move gradually away from the FTE-pricing model, with real progress already being recognized in banking and insurance verticals. It is interesting to note another important characteristic that is starting to differentiate the providers in this list, is the margin of the providers - and we believe the need to maintain margin is slowing growth for many of the Western incumbents. As can be seen in the chart above, the average operating margin for the Top 10 (excluding SAP and Oracle) is 11.5%, with IBM, Accenture and TCS the only top 10 providers with margins in excess of 10%. IBM and Accenture growth may have slowed in the past 24 months, but they have maintained margins. What is worrying for some of the other providers is growth and margins have been compressed by recent market conditions, namely price-squeezing and service commodotization, making it more difficult for them to invest in restructuring / offshore infrastructure / technology imperatives needed required to halt the decline. As a result, the next likely entrant with strong Indian roots will be Cognizant, where the likely formula for entry being CSC to lose a further $1 billion in revenues and Cognizant to gain another $3 billion - a very likely occurrence based on the recent trends, when you consider Cognizant's recent growth surge and ability to maintain margins at the 19% level. The Bottom-line: The naysayers will claim the Indian majors will run out of steam, but who's really going to challenge them as the delivery model matures? As we discussed last month, the Indian majors doubled their market share in global services in barely four years - and while access and management of lower cost offshore talent is a key factor, even when that advantage peters out, the sheer passion and culture of the Indian firms sets them apart from many of the flagging Western incumbents. Moreover, as IT services continue to commodotize, it's becoming almost impossible for many of the incumbents to come back. At HfS, we see longer-term disruptive factors, such as advances in automation and robotics and cloud platforms, which could actively negate the need for outsourced labor, as the bigger threats to the Indian majors, but these are still a few years away from making significant inroads into the mighty IT Indian services model. 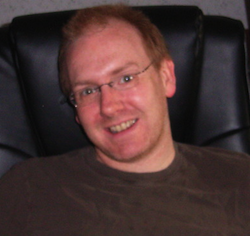 You can read more about the HfS IT Services Top 10 in our new report "TCS Breaks into the HfS IT Services Top 10", authored by Jamie Snowdon and Phil Fersht, by clicking here. 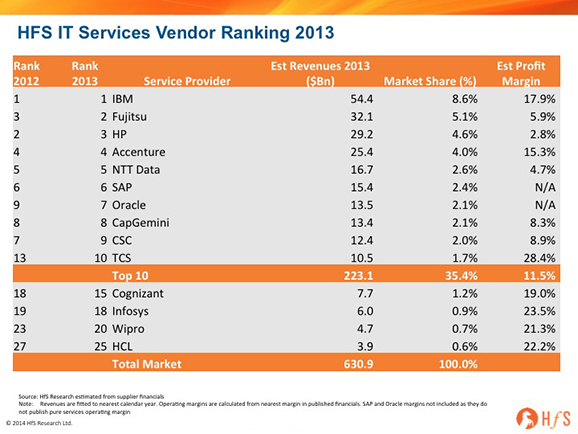 TCS has got the highest margin amongst top 10 service providers. The challenge for TCS would be to maintain those healthy margins whilst continuing to increase the market share. TCS's revenue numbers are more than 13 billion USD according to their Press Releases. Something is wrong with the numbers here. As mentioned in the article - these numbers are IT services only. BPO and R&D are excluded.